At Goldring we are proud to boast over 100 years of rich heritage and expertise. 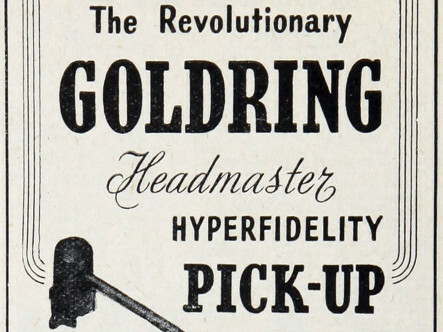 The Goldring brand has long been synonymous with all that is great about British hi-fi and is a name closely associated with quality, innovation and reliability throughout the long history of the gramophone record. Goldring started life in Berlin in 1906 when two Czech born brothers, Heinrich and Julius Scharf, began to manufacture parts for the nascent gramophone industry under the name Gebrüder Scharf. 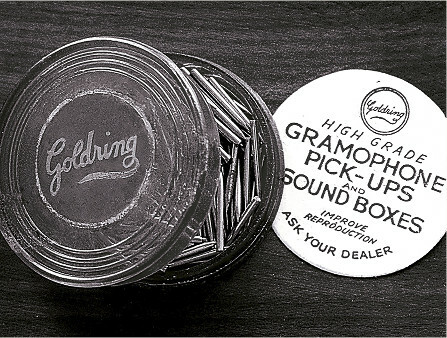 At first the Scharf brothers concentrated on gramophone needles, clockwork motors and governor springs but soon branched out into more sophisticated “sound boxes” - which were the all-acoustic ancestors of the modern magnetic pickup. 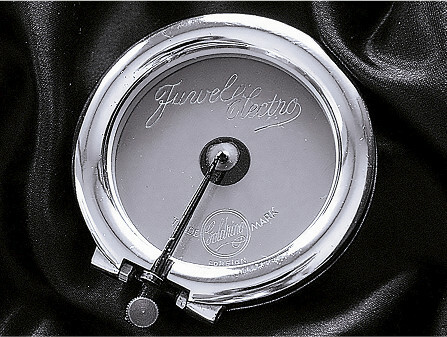 Throughout the 1920s product development continued and in 1926 the now iconic Juwel Electro sound box was launched, incorporating a mica diaphragm and sporting the Gold Ring trademark to denote superior quality. These pieces were designed specifically to get the most out of the latest electrically recorded gramophone records, hence the Electro moniker. The Scharf brothers stayed at the forefront of innovation, patenting technology for the emerging electric gramophone pickup industry in the 1930s. The company moved to England in 1933 where we were managed by Heinrich’s son Erwin, later joined by his brother Freddie. Together they re-formed the company as Scharf Bros from a factory in Woodford, Essex, where we continued to manufacture traditional acoustic sound boxes and newer electric pickups. With medium tone needles the pick-up gives quite a creditable performance on normal records, the reproduction is clean and articulate, just a trifle edgy in the treble at large volume levels, but with no tendency to over-emphasise the lower frequencies. During World War 2 we used part of our factory at Woodford to help the war effort, but still continued the research and development begun before the outbreak of hostilities. The Scharf Bros perfected the model 100 magnetic pick-up cartridge and the versatile Headmaster tone arm at a new factory in Dalston, East London – after the original factory was destroyed by a V-1 flying bomb. In 1953 the company was officially renamed “Goldring Manufacturing (GB) Ltd” and was soon relocated to Leytonstone in East London where nearly 100 employees worked on every stage of manufacture. The Scharf brothers pushed ahead developing revolutionary and highly successful magnetic pick-ups such as the No. 500. It had a ‘turnover’ 33/45 rpm double sapphire stylus and was smaller and lighter than the older designs, being described as the first ever hi-fi cartridge with low dynamic mass. 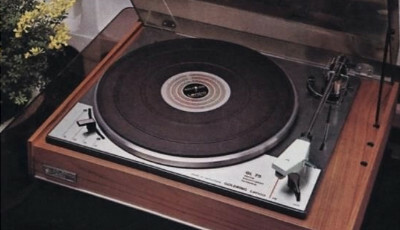 The Goldring 500 was widely used by the BBC and was acclaimed throughout the world, giving Goldring a place at the top table of globally-renowned hi-fi manufacturers. This latest Goldring Cartridge, No. 500, is a complete answer. It has an exceptionally long frequency range, and I have not been able to detect any non-linear distortion even on records of large amplitude. Its design, indeed, seems to have solved all the problems which some of us encountered when we made our moving-iron pickups in pre-war days. By the early 1960s stereo LPs were gaining popularity so we modified our latest model 600 cartridge to work in stereo, naming it the model 700. However, the new cartridge was too bulky and the tip mass too great to properly track stereo records. 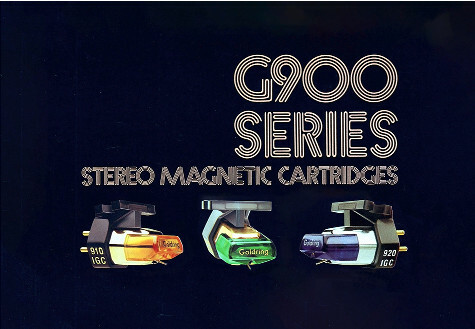 Design work therefore began on an entirely new design and in 1967 the G800 “variable reluctance” type cartridge was launched. It was an instant success, the new design enabling the moving mass of the cartridge to be kept low permitting a playing weight of less than 2g. 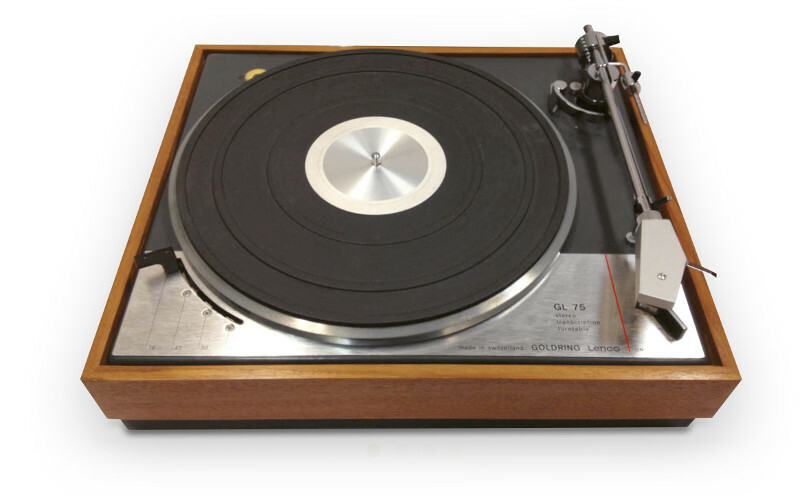 This helped to make it compatible with the light weight pickup arms being fitted to the fast-evolving turntables produced worldwide during this boom time for the hi-fi industry. 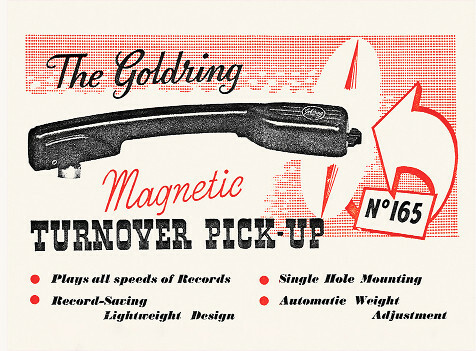 There should be no doubt in the mind of any reader of this report that the Goldring 800 Super E is a first-class pickup at an eminently reasonable price, which puts the kind of quality typical of the best and most expensive moving magnet designs within the reach of an increased number of people. We offer sincere congratulations to Mr. Scharf and his associates in this enterprise, for this is the first British product of this type and class, and one which we feel should stand up well in world markets against the American ‘big guns’. During the 1950s Goldring teamed up with Swiss turntable manufacturer Lenco in a partnership which would last some 20 years. This saw the launch of several different products, including the critically acclaimed GL75 turntable in 1967, a model still sought after today which stands up well to modern scrutiny with its legendary build quality and superior idler wheel drive design. Goldring enjoyed great success in the late 1960s and early 1970s and was floated on the stock exchange, moving to a larger premises in Bury St Edmunds in 1974 where we employed nearly 300 people. It was here that the 900 series was designed and manufactured. Advances in magnetic materials allowed tiny, powerful magnets to be fitted directly onto the upper end of the cantilever to form some of the first moving magnet cartridges. The company became Goldring Products Ltd. in the late seventies and was passed on to Gerry Sharp, grandson of founder Heinrich Scharf, as we returned to private ownership. 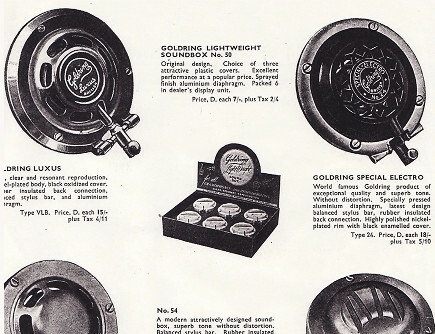 As super strong magnets such as samarium-cobalt and later neodymium became available, Goldring began to develop even more advanced cartridges using a fixed magnet and a moving coil. The Electro II launched in 1983 was our first MC cartridge, gaining sonic advantages by having a lower moving mass and low output impedance. The MC technology was further refined in the form of the Eroica and Excel, meanwhile MM cartridge development continued with the launch of the original 1000 series in 1985. Where the Eroica proved excellent was on things like voice rendition. It provided any vocals with a subtle and expressive quality that gave a pleasant impression of naturalness. Very well behaved; extremely tolerant… Those seeking a refined and smooth sound would be well advised to check out Goldring’s Eroica. 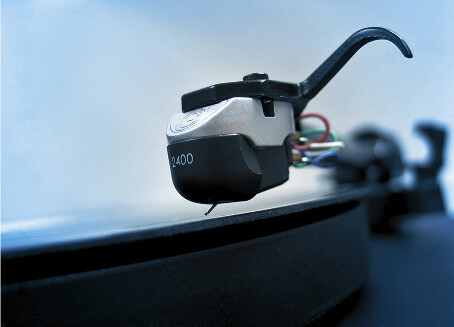 Since CD technology was introduced in the 1980s many consumers began to move away from records and turntables. 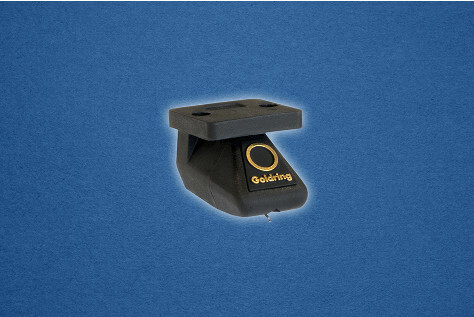 By this time Goldring had downsized considerably and outsourced much of our component manufacturing work, allowing us to focus on technical development and remain at the forefront of cartridge design. The high performance Elite MC cartridge was developed for a more discerning specialist market, and the 1000 series MM cartridges were further improved. 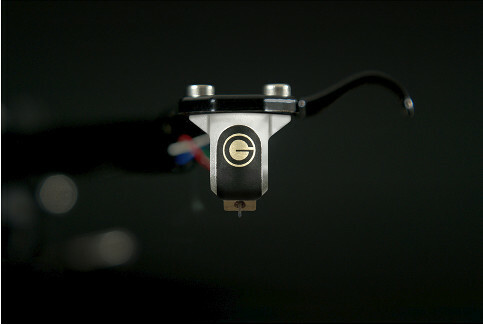 The company took a second venture into turntable design in the early 2000s, launching the GR1 turntable in 2003 followed by the award-winning GR2 in 2005. Cartridge development continued with the introduction of the 2000 series which implemented a moving iron design with low moving mass and a range of advanced stylus profiles. Goldring moved to Bishops Stortford and in 2009 the flagship Legacy MC cartridge was launched, combining an innovative design from our ‘back catalogue’ with modern materials and manufacturing techniques to produce a class-leading result. 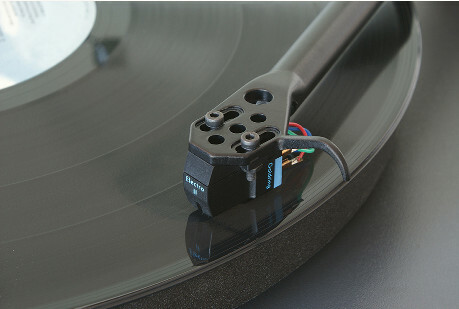 Thanks to a resurgence of vinyl popularity throughout the early 2010s, a new market began to emerge with a younger generation of consumers turning their attention to turntables and cartridges. 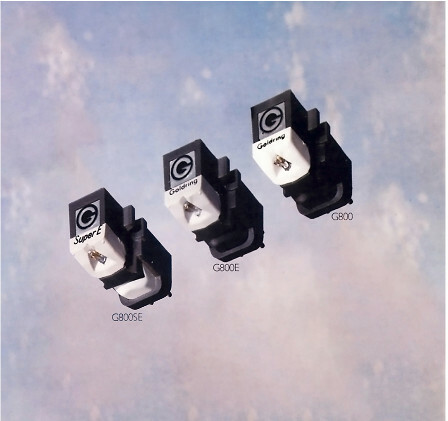 Goldring responded by developing the E series, a set of high-quality entry level MM cartridges which were well received by Vinyl enthusiasts. We also pushed ahead with MC cartridge development, making use of emerging technologies to create the Ethos, our highest performing moving coil cartridge, launched in 2018. Through the Goldring, vocals are expressive, drums hit hard and there’s a good dose of energy. The sound it delivers is clear, informative and still fun. We can’t ask much more than that at this level. If you’ve got a good mid-priced deck that’s in need of an upgrade to the cartridge, we can’t think of an alternative that’s so capable. Simply, the E3 is a great buy. © Copyright Goldring, All rights reserved. Copyright © 2016 Q Acoustics. All rights reserved.